Unity and variety are two of the most fundamental principles of design. When used correctly, these two principles complement each other and result in artwork that looks just right, complete, and pleasing. Unity happens when the parts of a scrapbook page or layout (or any kind of art) work together to be seen as a whole. It’s difficult to specify exactly how to achieve it because unity is an impression of the person that is making the observation. It is a feeling that is conveyed to the viewer of the art. And because we’re unique, each of us with our own perspective, it comes down to who you are making your art for. With all that said, there are a couple of tips that have proven time and time again to result in artwork that looks unified to pretty much everyone. The first tip will sound fairly obvious: greater unity can be achieved by reducing diversity! In this instance, we specifically mean reducing how much diversity you employ in each of the main elements of design (shape, color, lines, texture, space, value, and form). In our example above, you can see that we kept to just a handful of colors and basic shapes, most of them created by straight lines. Because the various elements of the page share many attributes, there is less diversity and greater unity. This leads us to the second principle of design we are discussing today. To create pages that are visually interesting and exciting, you have to have variety in your art. Variety occurs when you use differences and change on your pages to increase visual interest. 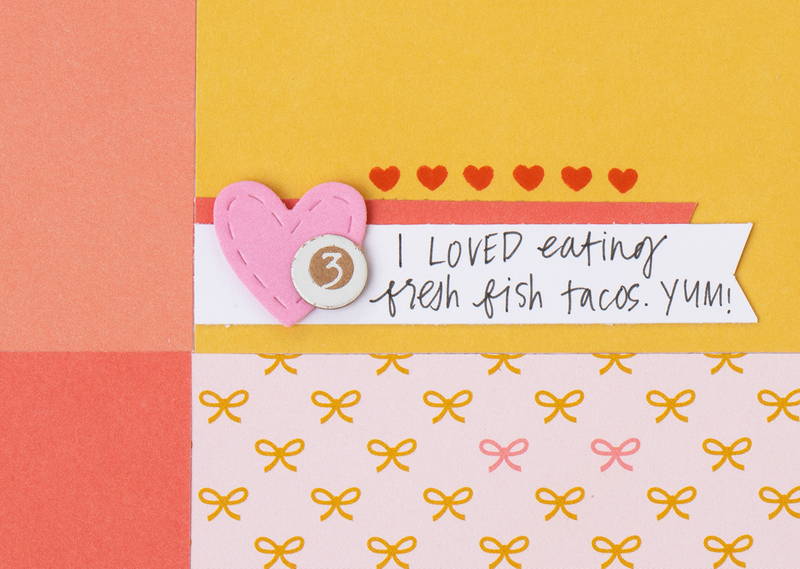 The scrapbook page we are sharing with you today is made up of 12 3″ x 3″ squares. This works well in this instance because of the variety in the patterns, colors, and photos. The elements need to be alike enough so we can see that they belong together and at the same time different enough to be interesting (harmony). The principles of art are tried and true methods for organizing the elements of your art. When all of the pieces work together, the result is harmonious! 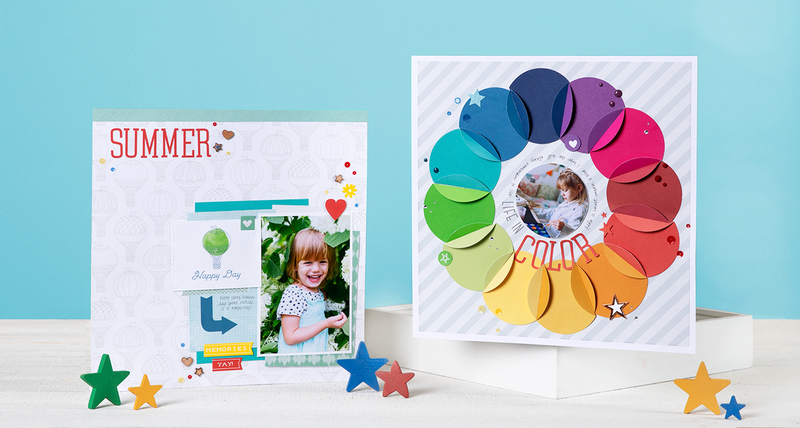 Make an effort to strike a good balance between unity and variety on your scrapbook pages so that your albums will be brimming with enjoyable works of art! Keep following us on the blog to learn more! 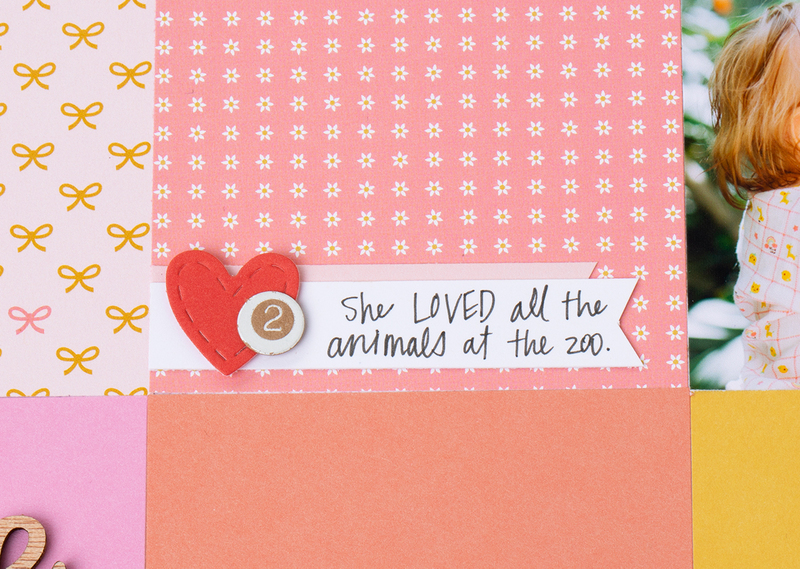 Many of us scrapbook with storytelling as our primary goal. Preserving stories is the main factor we keep in mind as we design pages, layouts, and albums. The story is what guides our photo placement and the order of events. Sometimes, we even go as far as labeling parts of our pages to help the viewer follow a specific path through our stories. Today we’re going to discuss two design principles that will help your artwork do some of the storytelling for you. These two principles work together to organize different elements within your artwork in order to create a natural visual flow. Rhythm is something that catches the viewer’s eye and continues to move it through the artwork. It is created through slight differences in a pattern and repetition of elements, and, just like in music, it can vary in pace depending on how heavy your patterns are and how often they repeat. Movement is the path that your eye takes through the art. Can you spot the rhythm causing elements in our example scrapbook page above? There are several, so let’s talk through a few of them. First, take a look at those colorful pennant banners. There are two, both made up of equal-sized triangles and the same color scheme. As a pair, these two banners catch our eye and move our attention from the top left of the page to the center. Even each banner has its own rhythm because of the repetitive triangle shape. A second place we find rhythm in this piece is in the cluster of squares and rectangles made up of the two small photos, the white rectangle behind the lower banner, and the small journaling card. They are all similar enough in shape and size to consider them a repetitive pattern. This rhythm generates a sense of movement in the lower middle section of the page. A third, subtle, way we created movement in our example is through the repetitive use of blue sequins. We started out at the top left, moved to the middle, then across to the bottom right. Another place we see rhythm and movement in this one page is with the color yellow. From the banners, to the photos, and the paint washes, there are small accents of yellow carrying our attention from one place to the next. These are just a few of the many ways rhythm is creating movement in this example piece. Now that you know what to look for, can you spot any more? Most of you reading this blog naturally look at things from left to right, top to bottom. It’s how we’ve been trained to read the world around us. To keep with this natural rhythm we’ve all been subconsciously taught, keep it in mind as you create your artwork so that the finished product will look and feel pleasing to you and your audience. In the following two-page layout we use lines, shapes, color, and space to create rhythm and movement from one page to the other, following a left to right, top to bottom flow. In the left page, where we will always know to begin, we are first drawn to the title for several reasons. One of which is because it is framed with yellow lines and accents. From this highlighted title, the yellow rhythm continues to the surfboard in the 4 x 6 photo and then from one cluster of embellishments to the next until we reach the end (or right side) of the second page. Also creating rhythm and visually moving us along from left to right are the blue lines, blue photo mats, and blue arrow. Creating rhythm and movement in artwork will take practice and patience to master. The first step in the process is to know that it is there. Make note of it in other people’s art and learn from it. Take what you see (and like) and incorporate it into your artwork as best you can. With practice it will eventually become second nature and you will be visually guiding others through your artwork and your stories intentionally and with purpose. We’ve talked quite a bit about how to make harmonious color combinations based on color theory and the color wheel. Today we’d like to branch out and look at some other visual elements that can boost your artwork beyond the use of color. Balance is a design principle that refers to the distribution of visual elements (such as shapes, colors, space, and textures) and how they relate to each other in terms of their visual weight. That term “visual weight” sounds a bit complicated, so let’s take it back to the playground to explain. Consider two children on a seesaw. To have a fun experience, the children on either side of the seesaw should be relatively the same size or weight. If one child is heavier than the other, the seesaw is unbalanced and it will continuously want to tip to the one side, creating an unpleasant experience for everyone involved. The same idea applies when working on two dimensional paper projects, such as scrapbook pages or cards. We tend to strive, usually without thinking about it, to create artwork that is balanced. A balanced work, where the visual weight is distributed evenly, appears stable, is pleasing to look at, and makes the viewer feel comfortable. Work that is unbalanced does the opposite. Sometimes artists will create unbalanced art on purpose, but that is pretty rare in scrapbooking and cardmaking. So how do we apply this design principle to our craft? There are a few different approaches to achieve balance in your artwork—and we brought examples! So far we’ve been alluding to probably the simplest approach, and that is something known as reflection symmetry, where one side mirrors the other (both kids on the seesaw are the same size). This is an easy way to achieve balance and doesn’t require too much consideration. Simply draw a line (hypothetically, you don’t really have to draw a line) down the middle of your work and then mirror what you create on one side on the other side. The line can be drawn vertically, horizontally, or even diagonally. Radial balance is another type of symmetrical balance where the visual balanced is based on a circle (don’t worry, we won’t quiz you on these terms we’re throwing around—the principle matters more than the vocab 🙂 ). The design has a center and it extends from there. Daisies, a star, and the sun (when depicted with it’s rays) are all examples of shapes in radial balance. 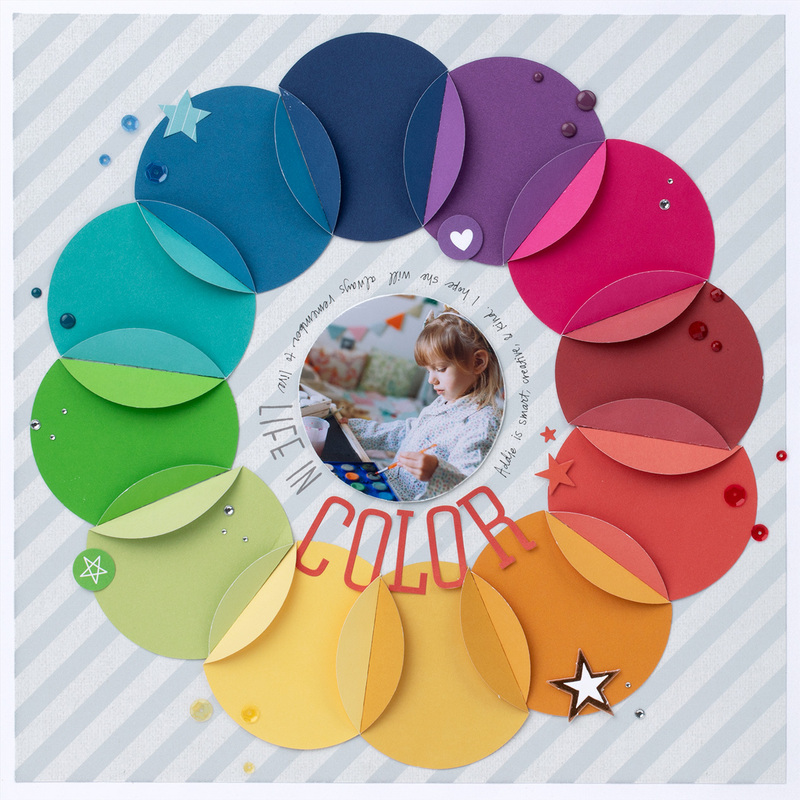 The page above is a beautiful example of one way you could use radial balance in your scrapbooking. The downside to symmetrical balance is that it can sometimes come across as too simple, or boring, since both sides are visually the same. But there’s more, so keep reading! To have balanced artwork does not mean that all of the pieces on your scrapbook page or layout have to be the same size and laid out in perfect symmetry. Back to the seesaw—if you have a big kid that wants to play but don’t have a child of the same weight to balance him out on the other side, you create the weight by stacking two or three kids opposite the big kid. Another option would be to move the big kid closer to the center of the seesaw with just one smaller child on the opposite end to achieve balance where the two can play harmoniously. In art, if you have a large object on one side of your work it can be balanced with several smaller items on the other side. Or, instead of increasing the number of parts on your scrapbook page (because sometimes we don’t have them or just don’t want them), move the larger piece closer to the center and balance with the smaller elements on the opposite side. Take a look at our asymmetrical page above. This page is asymmetrical because it has unequal visual weight on opposite ends. To balance it, our “heavier” elements were moved closer to the center and were countered with a handful of lighter elements on the other corner. When done correctly, asymmetrical balance is more interesting to look at. It offers more visual variety and even has a more modern feel to it. To determine whether or not your artwork is balanced, rely on your perception of it. No one area should draw your eye so much that you can’t see the others. Also, consider how it makes you feel. Do you like it? Is it comfortable to look at? Or do you sense that something is off? Balance is the first of several basic design principles we will be discussing on this blog. Make sure to subscribe and to check back with us regularly to learn how to better use the elements of art in your artwork. What makes a work of art a work of art? 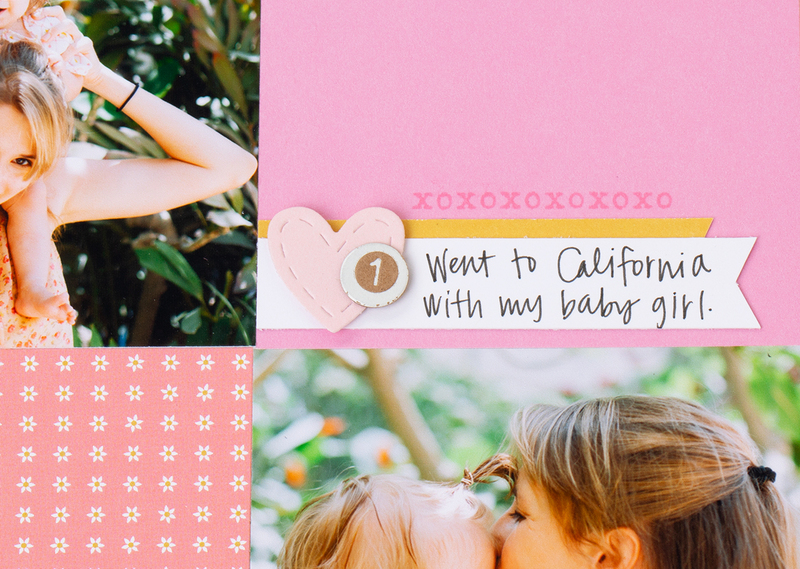 What turns a good scrapbook page into a great scrapbook page? There are many answers to these questions, but one thing that contributes to great scrapbooking and all types of crafting is having a strong design. There are certain principles that contribute to the strength of a design, which can really elevate the final product. Many well-seasoned crafters probably use these design principles without ever having “learned” them or even realizing they are doing it. However, for those who are new to crafting, these principles can be absolute lifesavers, and they can even give you a great place to start—a springboard for reaching greater heights. And even the most gifted crafters will inevitably find themselves tangled in the details of a complicated project as they struggle to see the big picture. At such times, it’s always good to get back to the basics. So, what are the design principles that work together to make this page so wonderful? We’re so glad you asked! 1. Pattern. Now, we’re not talking about incorporating our B&T Duos™ patterned paper here, though that does go a long way to make any project beautiful. 🙂 We’re talking about using repetition. In the page above, you can see a strong pattern of horizontal lines—the horizontal strips of paper above the photograph, the Cricut® banner underneath the title, the kraft paper behind the photo, and even the lines of corrugated metal in the photo itself! The possibilities for creating patterns through repetition are endless: Try repeating colors, shapes, and many other elements to create pattern. 2. Unity. Having all the different elements on a page work together is what makes the page look well thought out. Think of it like an orchestra: There are many different instruments, but they have to work in harmony to play something beautiful. One way to create this harmony is through color. Our artist used many warm tones on the page: Gold shimmer trim, Honey, Canary, and kraft cardstock, a strip of paper from the Brushed paper packet, a Canary stamped image–all these pieces tie in nicely with the color of the boy’s shirt in the photograph to create a sense of unity. Unity can be created a myriad of ways, so get creative! You’ll find it’s much easier than you think! 3. Variety. Though it’s important to create harmony, it’s also important to make each element unique—this is what makes the page have depth. An orchestra wouldn’t be an orchestra with just violinists! Start by determining what you’d like to unify your elements. Like we mentioned above, our artist used warm tones to create unity. Then, for variety, she used several different textures, shapes, sizes, etc. There is also variety in the cool colors used in the bottom half of the page versus the warm colors used in the top half. All of that further plays off the contrasting colors in the photo. Using a variety of products, from embellishments and twine to embossing folders and Cricut® cuts, also makes adding variety even easier! 4. Balance. This design principle is demonstrated in spades in the page above! Our artist decided to use symmetry as her primary means of creating balance, though there are other certainly other ways to create balance. Placing the photograph in the very center of the page, she then embellished all around it in a beautifully balanced way. 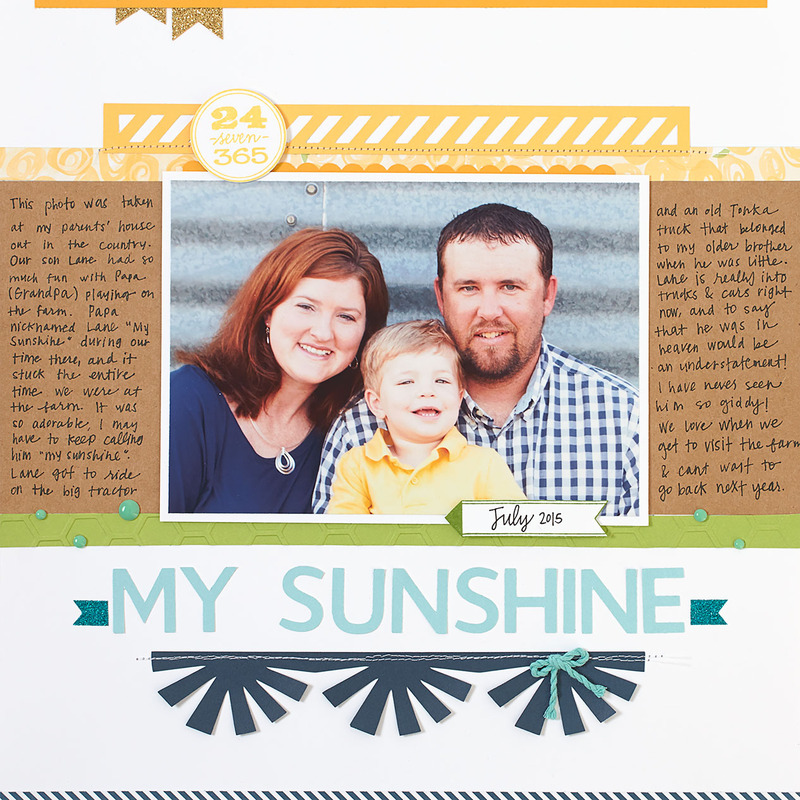 Notice how the width of the “My Sunshine” title mirrors the width of the Canary, Cricut®-cut strip above the photograph. The symmetry of the page is not strict—those aqua dots are not lined up, people!—but the sense of balance persists in the way the elements offset each other on the page. You have to love how the gold shimmer trim and the Canary stamp in the top left part of the page balance the “July 2015” sentiment and the Glacier Extra Thick Twine bow in the bottom right. Now that you’ve taken a few steps back to find your center, it’s time to return to your crafting space and tackle that tricky project. You can use these four basic design principles to help you through any crafting project, and before long, they will become second nature to you! Happy crafting!